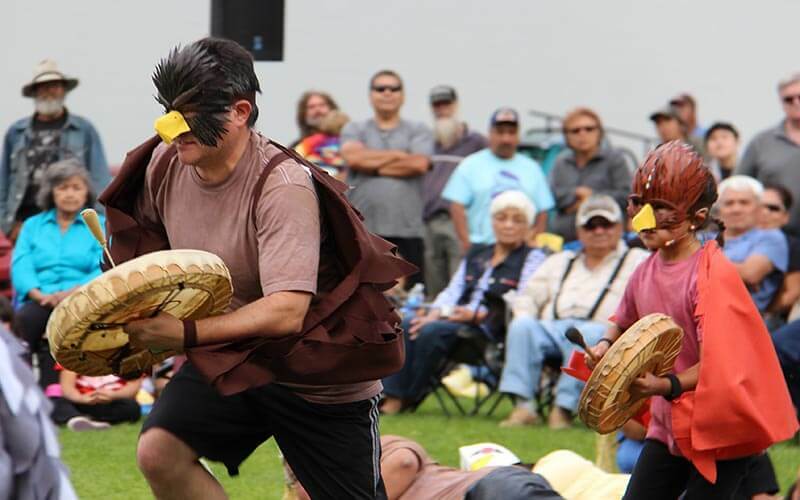 The “Battle of the Birds” will take flight in February at the Talking Stick Festival in Vancouver. This ground-breaking community engagement theatre creation led by of Kevin Loring and his Savage Society theatre troupe is based on a traditional Nlakap’amux story. The production features an award-winning cast and is full of songs derived from collaborations with professional artists working with community members. “It was exciting to have worked with the community and a talented group of Aboriginal artists over the month of August to workshop and develop this performance piece,” said Loring, a Governor General Award-winning playwright. The Talking Stick Festival features some of the best emerging and established Aboriginal artists performing theatre, storytelling, writing, music, dance, performance art and visual arts. The 15th festival takes place in Vancouver in February. The “Battle of the Birds” debuted at the Lytton River Festival in September following a series of community workshops to develop the piece. Loring and a team of talented First Nations artists worked with communities to bring renewed life to this ancient Nlakap’amux story. It involves a community confronting the issue of domestic violence. Set in the mythical time before time, the Bird nation is alarmed because Bald Eagle is abusive to his wife and takes action. >The story is one of dozens captured at the turn of the last century on wax cylinders by renowned anthropologist James Teit. Savage Society and the New Pathways to Gold Society (NPTGS) have been collaborating since 2013 to bring these stories to contemporary audiences as part of the “Songs of the Land” project. “We’re really pleased to see these timeless stories shared with a broader audience,” said Cheryl Chapman, NPTGS First Nations Co-chair. NPTGS co-chair Terry Raymond said NPTGS is dedicated to assisting the development of Aboriginal and heritage tourism products throughout the Gold Rush/Spirit Trails corridor from Hope to Barkerville and beyond. “The Songs of the Land is a very special project and one that exemplifies the spirit of reconciliation between First Nations and other communities to build a brighter future for all British Columbians,” Raymond said.